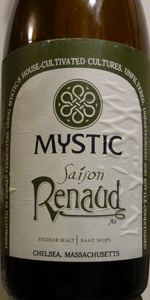 Saison Renaud exemplifies a modern take on the traditional farmhouse ale. Made with just pilsner malt and Saaz hops, this recipe is made to truly let the assertiveness of our house yeast shine. Presenting a clean and crisp body, the spicy and fruity esters of the yeast prevail over a slight earthy bitterness from the Saaz. From the corked, caged bottle with no noticeable date. Sampled on March 10, 2019. The appearance is an unfiltered, slightly hazy yellow or pale amber with a soft, lingering white head. The aroma gives off a bright lemon and toasted white bread crust character with Belgian yeast and a hayfield. The body is medium to full but very smooth. The taste is sweet at first but the lemon zing is also present. The finish is dry and only mildly tart. Poured from 750ml bottle into glass. Batch Code: 00004131. Corked and caged bottle. Slightly cloudy, pale gold colored body, with good visual evidence of rising bubbles. One finger of white head, which is foamy, and disperses quite quickly. Each sip leaves behind a thick web of lacing coverage. Aroma of yeast esters and slightly spicy hops. Taste is dry and full of yeast esters and slight funk. At the end the spicy hops introduce themselves. Thicker mouth feel from the yeast. Effervescence in the mouth. Good carbonation. More smooth than crisp. Thoroughly satisfying yeast driven farmhouse ale. Dry but refreshing. Very good on its own, but would be terrific when paired with lunch fare such as rustic sandwiches with cured meats and flavorful cheeses. The last pour introduces swirling layers of yeast sediment. Nice mix of earthy hops and spicy yeast components. But the Pilsner-style aspects maybe aren't the best addition to the saison. Overall a pretty good saison! Interesting and different, though not my favorite I've had. A: Pours up a slightly hazy gold with a frothy to creamy two finger head and nice lacing. T: Soft, round, and subtly yeasty, with a slight bitterness and not much in terms of hop spiciness, there are some apple cider notes coming through here, and the malt is as advertised though it doesn't shine through in any particular way. M: Seems a bit full, almost like it's weighing down some of the flavors trying to come out here. O: I'm going to go out on a limb here and suggest that this is either an old bottle or a bad batch, I'm not an expert on this but here is why: It isn't terrible, but reminds me in some ways of a 9 month old bottled of Avec Les Bons Vœux I once had, so it seems like this is actually a very good beer, but I don't sense that this is a good bottle, I've never had a saison that lacked crispness in such a profound way, and I really don't think that this is what the brewers intended. I'm not going to give this terrible numbers, that wouldn't be fair, but I can't give it a five either, so, going on faith from what I can tell that's here and knowing what I know about how these types of beers can age (not much, but enough to have my suspicions, and I've certainly done written reviews of a lot of saisons, 71 counting this beer) I'm going to give it a 3.5, which I think is more than fair and I will certainly try this again at a later date and update my review if it seems that I was correct in my assumptions. Reviewed from (long-standing) notes. 2014 vintage cork and caged bottle. Poured from a 750 mL bottle into an El Catador Barrel-Aged glass. A: Mildly hazy (as long as you don’t pour the trub) and light gold. A thin white head forms and fades pretty quickly. A fairly good blush of visible carbonation at first, though it fades quickly. S: Musty barnyard and lemon-forward citrus. Cracker malt body with only a mild pilsner character. Some hay and grassy, with hints of dried peaches and white vinous. Pretty appealing, though not a huge aroma. T: A disappointment here. Lemony and earthy. A mix of pilsner and cracker malts – much more sulfurous pilsner than the nose suggested. Again, some white vinous character, and just a bit of caramelly oxidation to the malts. Some sweet yeast esters – but not really fruity. No black pepper character here. No real funk here whatsoever, even after the cellaring. It finishes dry and mildly bitter. M: A light body and decent carbonation sensation for style. Low alcohol presence. O: This drinks more like a yeasty, hop-forward pilsner than a saison. There's just not the funk, or barnyard, or yeast, or black pepper, or citric tartness…or any of the alternate qualities I’m looking for in a saison. O: An impressive saison, for sure. Remarkable balance, bold flavors but in a balanced way. Complex, yet not to the point where it is overburdening. Subtle and superb, highly recommend.